Originally posted on 16 February 2017. Scroll down for news of the 3.03 update. Marmoset has released Toolbag 3.02: a free ‘Valentine’s Day’ update to its real-time rendering toolkit. Despite the version number, the update adds a number of fairly significant new features to the software, including support for animated materials, a new refraction shader, and EXR output. The latest update builds on the animation features added in Toolbag 3, adding a new option to record and edit material animations directly within the software, as shown in the video above. According to Marmoset, “most” material parameters are supported, including Albedo, Emissive and UV tiling. There is also a new refraction shader for transparent materials, with parameters to control index of refraction, caustics, and mask-based blending between the refraction and standard Lambertian shading models. Other new features include a more drag-and-drop workflow for loading textures, a new geometry smoothing filter when baking textures, and the option to output screenshots or animation in EXR format. Updated 13 July 2017: Marmoset has released Toolbag 3.03. The update, which restores Mac support and adds support for Python scripting, is still officially in beta, but you can download it via this Facebook post. 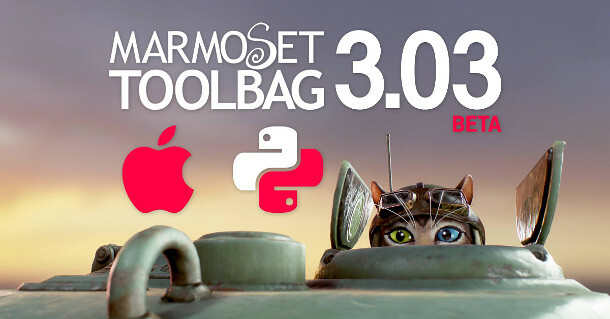 Toolbag 3.03 is available for Windows 7+ and macOS. New licences cost $189 for individual artists and $379 for studios. The update is free to existing users.